2016-2017 is an iPad Refresh year for Monroe Jr/Sr High School. This means that ALL students attending Monroe will receive a new iPad (model based on student/parent selection). To assist parents in protecting their student's new iPad, I have listed some accessories for each type of iPad available for the upcoming school year. Peruse the selection, and if one of the items listed interests you (and you would like the school to purchase), let us know and it will be installed on your student's iPad when it arrives. Remember any accessory must be PRE-PAID before it is ordered (stop in the school office to pay). If you selected accessories when you selected your student's device, confirm your selection with the front office, arrange payment, and the accessory will be ordered/installed before the start of the school year. Be advised, the Logitech Create keyboard case for the 9.7 iPad Pro has not been released yet. There are literally thousands of iPad cases on the marketplace today. What parents should look for are cases that offer drop protection for the iPads (the number one reason for warranty turn-ins)! Remember the type of iPad your student has before ordering ANY accessory. If you are unsure of your student's device, contact the tech department before ordering. iPad Air 2 Cases: I came across THIS article on the best iPad 2 cases. There are some great choices here, at very reasonable prices!!! ESR Yippee Case: One of the least expensive (yet highly rated) cases available for the iPad 2. Tons of colors available, Cases: These cases are very durable, and come in multiple colors and styles. Other Cases: Looking for a keyboard case? Check out Logitech or Zagg. Just make sure you select the Air2 model. The iPad Pro 9.7 is currently Apple's Newest iPad. Here is a recent article related to the best cases for the new 9.7 iPad Pro. While there are many vendors, some of the recommended ones include Zagg (multiple cases for the pro, including a ruggedized case) and Urban Assault Gear (UAG). When considering a case for the iPad Pro 9.7, remember to find a case that supports the Apple Smart Connector keyboard if you plan on using this great new feature. Currently the ONLY keyboard available for the smart connector is the Apple Smart Keyboard. 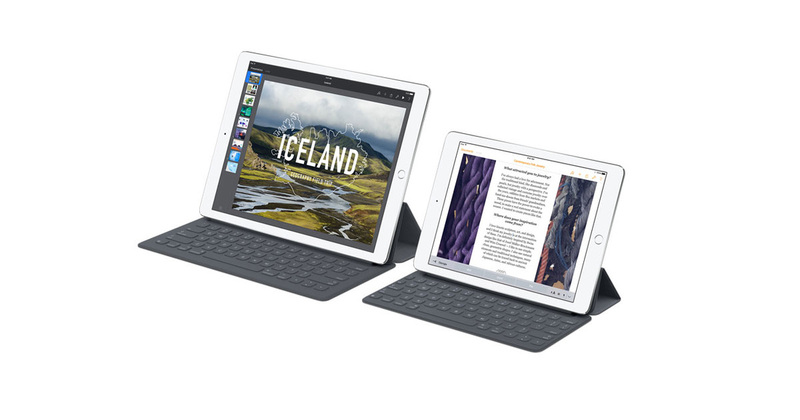 The iPad Pro 12.9: The iPad Pro 12.9 is the largest iPad currently available. There are some great cases for this iPad, and one of our favorites is the Logitech Create 12.9 case (shown). Just like the iPad Pro 9.7, if you plan on using a Smart Connector keyboard, your choices are limited to the Logitech case (mentioned above), or the Apple Smart Keyboard (remember you still NEED a protective case for the back of the iPad if you choose the Apple Keyboard! That is why we prefer either the Logitech case, or a protective case and then ANY bluetooth keyboard. A protective sleeve is a cover primarily designed to protect an iPad during transit. They DO NOT protect an iPad during use. They are a GREAT ADDITION to a protective cover, but do not meet the requirements for taking iPads home. In lieu of a protective sleeve, many student backpacks now have a separate compartment for storing electronic devices. This is a great idea for back-to-school purchases. HERE are some great examples on Amazon! As with cases, there are numerous keyboards available for the iPads. Any bluetooth capable keyboard should work with the iPads our students have, but the adage "you get what you pay for"seems to apply to keyboards too! Additionally, iPad Pro models support Apple Smart Connector keyboards. These keyboards are physically connected to an iPad, and do not require bluetooth to operate. For the 12.9 inch iPad Pro, Logitech has a GREAT KEYBOARD Case. 1. Long battery life (the wireless keyboards here are AT LEAST rated for three months battery charge or better!). 2. Durability/Construction: look at the consumer ratings for products. Stay clear of keyboards that talk about cheap construction, and that mention difficulty with dropped bluetooth connections. Yes, even Microsoft has a great keyboard for the iPad. This is a great folding keyboard with 3 month battery life, and allows for you to switch between two different devices. Apple Wireless Keyboard: Works with almost all Apple Products. Great BLUETOOTH keyboard that works with almost all Apple devices. The NEW magic keyboard is even rechargeable! Logitech Lightning Connector Wired Keyboard: This keyboard is connected via a lightning connector directly to you Apple device. No bluetooth setup or batteries. We have several of these in the Academic Center if you would like to check them out. Interested in something from this page. I am a human I am not a human. Please delete this message. These products are intended for student use/purchase. These products are not endorsed by the Catholic Schools of Fairbanks, but recommended based on consumer reviews/iPad use at the school.